Music fans having access to the complete archives of The Basement Tapes is somewhat akin to historians being presented with the tapes of the meetings of the Continental Congress or art buffs who receive a videotape of Da Vinci’s entire process of painting The Last Supper. Maybe that sounds hyperbolic, but there’s really no way to exaggerate the importance of what took place in Woodstock, New York and its surrounding areas throughout 1967 and the beginning of ’68. Every time there’s a back-to-basics reactionary movement in music against artifice and overproduction, it can be traced back to The Basement Tapes. Every time an artist borrows the basic structure of country music but shuns the rigidity of Nashville assembly line music and lyrics in favor of looser rhythms and messier emotional content, it can be traced back to The Basement Tapes. Any time a musician anywhere writes or plays a song with more concern for the truth within it than for what an audience might expect, well, you get where this is going. To recap the history, Bob Dylan comes off a breathless run of groundbreaking albums and polarizing electric-based tours, gets in a mysterious motorcycle accident, decamps to Woodstock in 1967, and calls the members of his backing group, then The Hawks but soon to be The Band, to join him. They while away the time cutting music for the next year or so with no other intent than to create some demos for publishing. These demos become the source of rock music’s first great bootleg before some of them surface in an official form on 1975’s The Basement Tapes. That release was pilloried at the time because Band leader Robbie Robertson included eight songs recorded by his group sans Dylan in studio settings to mix in with the actual stuff written and recorded in Big Pink and Dylan’s Hi Lo Ha house during that time period. Overdubs were also added to some of the tapes, filling out the sound a bit to make the homemade recordings a bit more palatable to the masses. That chronological take is one of the keys to this new release’s success, since it traces the way the whole thing developed. In the beginning, the boys (Dylan and Band members Robertson, Hudson, Rick Danko, and Richard Manuel; Levon Helm was a late arriver to the party and is barely a presence on the first several discs) took on old country classics like “I Forgot To Remember To Forget” and some Johnny Cash songs. The strange chemistry is immediately audible, as Danko transforms the lockstep rhythms of the originals with his loose-limbed bass work, Robertson plays soul licks over the C&W framework, and Dylan sounds forlorn when the lyrics are at their funniest and vice versa. Disc 2 is full of chaotic merriment. Two takes of “See You Later Allen Ginsberg” break down in hysterics, while the animalistic backing vocals of the obscure “Walking My Dog Around” are mirrored in the off-kilter moaning the Band provides to “Tiny Montgomery,” one of the first of Dylan’s major originals to appear. More often than not, the Dylan-penned songs on the first two discs are silly larks like the 50’s pastiche “I’m Your Teenage Prayer,” as he acclimated his writing muscles to the setting. Meanwhile covers of material as wildly disparate as the country lope “A Fool Such As I”, the soul classic “People Get Ready”, and the morality play “Be Careful Of Stones That You Throw,” are united by the sessions’ wondrous aura. Disc Three opens with a stunning Dylan vocal of the traditional “Young But Daily Growing”, and then he’s ready to start writing in earnest. What you’ll notice in these recordings of the most famous Basement Tapes tracks is how they crisp they all sound; instead of the ’75 release which tended to muddy the sound to play up the whole rustic atmosphere, the songs are presented here in their most pristine form, so that every nuance is audible as the men work their way through multiple takes of much-loved classics. Inspired lunacy reigns on “Million Dollar Bash,” “Yea! Heavy And A Bottle Of Bread”, and “Lo And Behold!”, Dylan locating the unmitigated joy of nonsense. That gives way to deeper meditations on life, love, and loss like “I Shall Be Released”, “This Wheel’s On Fire,” and the collection’s masterpiece “Tears Of Rage”, all still bewildering in their way yet as deeply felt and genuine as anything he ever laid down. 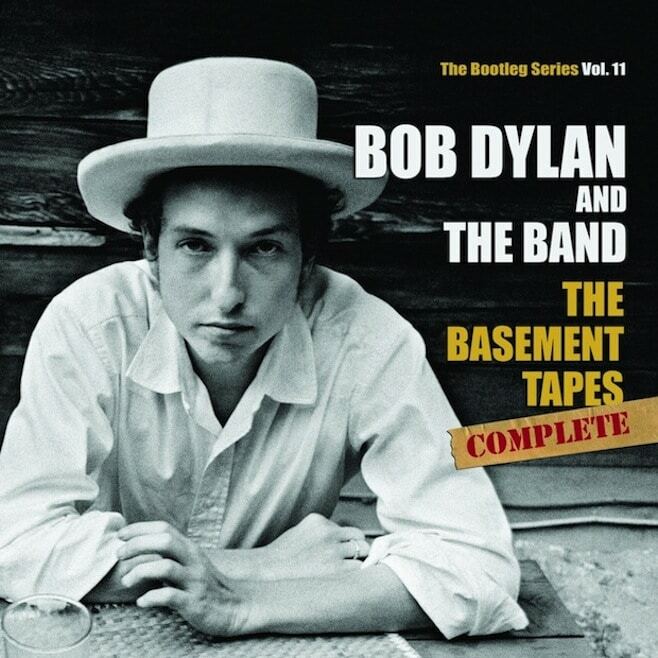 The Basement Tapes Complete also restores some classics that were left off the ’75 release, including the stirring gospel lament “Sign On The Cross” and “I’m Not There,” which might just reveal the meaning of life if we could ever pin down Bob’s exact words. Because there was no Helm, there are no drums on most of these songs, with the closest thing to percussion Dylan plucking on his guitar. That fact, along with Hudson’s spectral organ, places many of these tracks in a state of suspended animation. When Richard Manuel joins in with his ethereal harmonies, the entire effect is overwhelming. On Disc 5, Dylan feels comfortable enough to go into his back catalog and mess with some evergreens. Some relatively obscure originals also liven things up: the drunken, trombone-besotted “Bourbon Street,” the mournful “Minstrel Boy” (Helm’s earthy vocals joining the chorus), and the moody “Wild Wolf.” It’s understandable that the last song of significance on the last chronologically-ordered disc is “Goin’ To Acapulco,” with lyrics that skew fun on the page but are rendered with aching sonority. Robertson picks out his most pained fills, Danko sidesteps all the expected notes, Hudson swirls in like a benevolent spirit, Dylan and Manuel let out those elongated, harmonized “Yeah”s in the chorus, and the alchemy of The Basement Tapes in revealed in its purest form. Five stars aren’t enough, of course, to sum up this music. Maybe there are some tapes hidden out there for the bootleggers to scrounge up, but it seems likely that The Basement Tapes Complete has given us everything we truly need to hear from that extended magical moment in musical history. And still we’ll never quite understand it or be able to put a finger on what makes it so special. The mystery, the profound, luscious mystery, captivates us, cracks us up, breaks our hearts, and, most importantly, endures.